Another Jeep to beat a record during 2012. The brand sold 103.321 units* of its compact SUV, and contrary to most of American-made products, USA doesn’t count for a big part of its global sales. Its homeland market counted for 39% of total sales, and is closely followed by China, with 32%. Actually, the Compass was Fiat-Chrysler’s best-selling model in this Asian market (71% of Jeep sales in China). This is a good indicator of how Jeep can succeed in overseas markets, even if it is not a fresh product and is expected to be replaced by 2015. Of course, the Compass is one of the key products to be included in the production plans in China, along with Fiat-GAC. The big jump in China allowed this nameplate to beat a record and offset the falls in USA, and Canada. Italy was its largest European market, ahead of Germany, UK, France and Russia. In 2012 the Compass was introduced in Australia, where it got an excellent result (6th largest market). 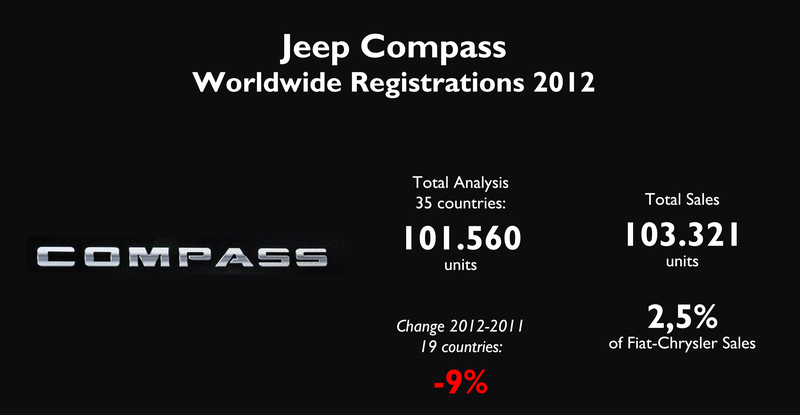 In 2012 the Compass achieved a sales record thanks to China and Australia, as its sales fell in other major markets. Source: see at the bottom of this post. Compass sales were quite balanced thanks to China, Canada, and Mexico. Source: see at the bottom of this post. 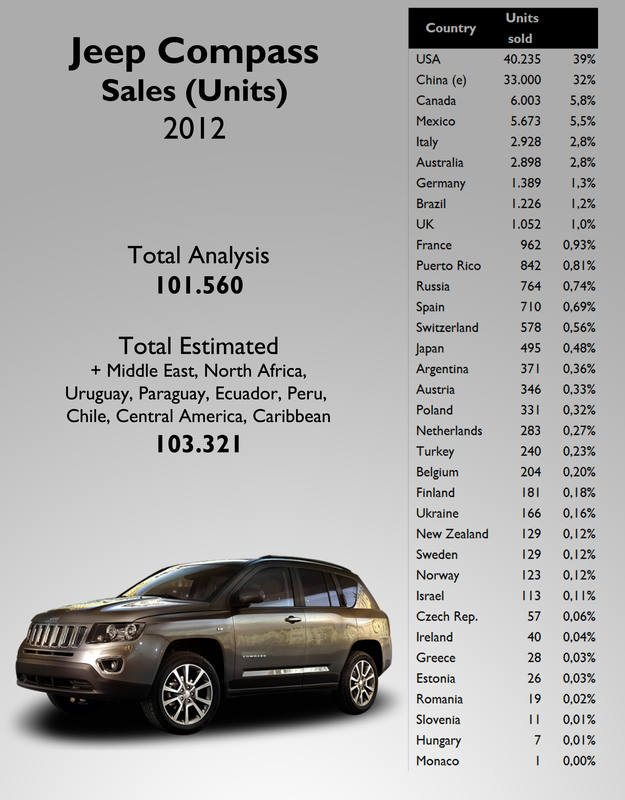 In terms of its role in C-SUV segment, the Compass shines in Puerto Rico, with 5,7% market share. It is followed by China (estimated), USA, Canada and Italy with 3% share circa. The Compass isn’t strong in European markets, as competition is quite hard with a strong Nissan Qashqai and VW Tiguan. Jeep is very strong with the Grand Cherokee and Wrangler, but its presence in the C-SUV segment must be improved with the successor of the Compass and Patriot. This segment is the largest in the SUV category in key markets such as Australia, Canada, China, France, Germany, Italy, Russia, and the UK. 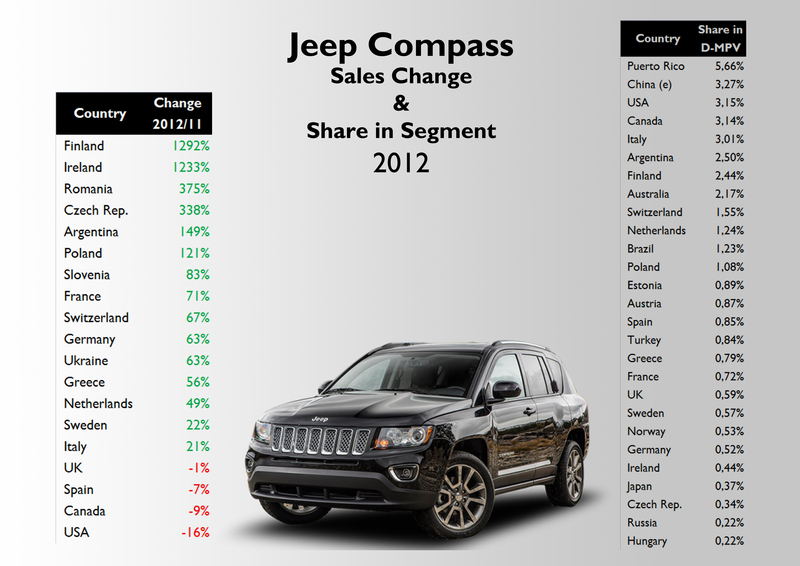 The Compass sales increased in small markets and China, while it didn’t have a good year in USA and Canada. Source: see at the bottom of this post. It is an important player in Fiat-Chrysler C-SUV segment. That’s why it needs a successor as soon as possible. Source: see at the bottom of this post. We know that it is the best SUV in its class and launching in India very soon. We would like to buy this SUV. Compass D segment ? I think it’s C.
I mean data ‘Share in D-MPV’ – it must be mistake. Should be C-SUV.